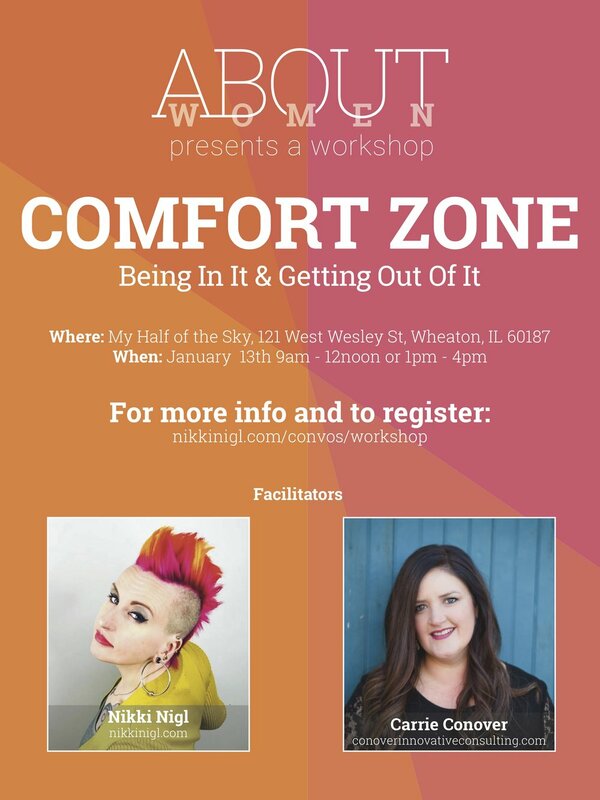 Please join us for this interactive workshop about getting out of our comfort zone. What is your comfort zone? Is it easier to stay there than to do something different? It’s called comfort for a reason - it’s comfortable - it’s what we know. But what if that was what is holding us back from trying something new? We are either in "BINGE MODE" or "CLEANSE MODE." All or nothing. There has to be a happy medium in between. We will begin hearing from Nikki on her research on the ABCs of how women are socialized and then we will deep-dive on our Actions, Beliefs, and Consequences. Why we do what we do. Why we make the choices we make. And how to enrich our lives and our loves. Carrie will share her story of starting her own business, the power of networking, and identifying a “board of directors” in your life. We will end the session connecting with other women who can help us reach our potential. Carrie Conover: consultant and podcaster, is passionate about connecting people. Carrie has spent 17 years in education and professional development and recently stepped out of her own “comfort zone” to start her own consulting company and successful podcast. Carrie lives in Wheaton with her husband, two children and spunky beagle. Nikki Nigl (rhymes with eagle): professional communicator who dedicates her life to motivating people. She has a Bachelor’s degree in Adult Training and Development and a Master’s degree in Communication, Media, and Theatre, both from Northeastern Illinois University. Nikki is Founder, CEO, Producer and Host of the ABOUT WOMEN EmpowHERment series. She is also Adjunct Professor of Communication at Northeastern Illinois University, and a public speaking skills coach for TED talk speakers.